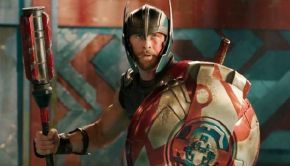 Thor is back in action with a new film that brings a lighthearted sense of humor, fun action scenes and stunning visuals - making it by far the best of the three Thor films. Thor, played superbly by man mountain Chris Hemsworth, gets banished from Asgard and is imprisoned on the other side of the Universe on Planet Sakaar by his long-lost sister Hela Cate Blanchett (Carol) - who has returned to stake a claim on the throne. In order to escape captivity and save his home Thor teams up with fellow Avenger Hulk Mark Ruffalo and Loki - everybody's favourite - played with relish and aplomb by Tom Hiddleston to stop the powerful Hela from destroying Asgard. Director, Taika Waititi did a fantastic job of creating a lighthearted tone that really breathes new life into the characters and story and brings the same zaniness to his direction as James Gunn brought to the Guardians of the Galaxy films. In comparison to the previous Thor films which were a more darker, Waititi made sure that this would be a film that you could have fun with and throws joke after joke at you, which will keep you laughing and smiling throughout. It was so great to see a more humorous side to Thor and taking risks (once he loses Moljnir in dramatic fashion) and leaves him in a vulnerable situation with us not knowing what his fate will be. Chris Hemsworth proves his comic chops here more tan ever with his bold and charismatic persona and the way he bounces off the interactions with other characters, particularly Hulk (in hot tub!) Making Thor more interesting and fun than he’s ever been in previous installments. The production design of the Planet Sakaar is so visually beautiful with its bright and vivid colours, that it really draws you in and really adds to the film's fun factor whilst also complimenting the wacky sense of humor and larger than life characters. The action sequences are so much fun and more memorable than the previous films, especially the gladiatorial contest between Thor and Hulk, which was so hilarious to see the two Avengers get pitted against each other. The film also treated us to an epic climactic battle set to Led Zepplin’s Immigrant Song which leaves you feel pumped up. Tessa Thompson gave a standout performance as Valkyrie, she balances both the badass and comedic elements of her character so flawlessly that you have a lot of fun watching her. She had a much more interesting relationship with Thor, than Jane Foster did in the previous films and hopefully we will see more of her in future films. As fans we would love to see a spin-off with Valkyrie. Another equally entertaining performance was Jeff Goldblum as the Grandmaster, his wonderfully mischievous and quirky personality makes for a magnetic character and leaves you wanting more. Cate Blanchett is so delightfully wicked as Hela, she is completely badass and holds a commanding presence in every scene and you can tell that she’s having a lot of fun with this role. The motive for the character to take the over throne and conquer Asgard, was a bit unoriginal - considering we’ve seen this villain motive in so many films, but Blanchett’s performance helps you to see past that and enjoy watching the character.